Richard’s dad was a boilermaker for the Southern Pacific and his Uncle Pete was a switchman/inspector for the Ogden Union Railroad & Depot. He is an Ogden native, born in the old Dee Hospital on Harrison Blvd. Richard later joined the Air Force where he spent 41 years in air craft maintenance on both piston and jet engines. After retirement, Richard became a docent at the Union Station and being close to big powerful noisy train engines just came natural. He morphed into a volunteer, helping to build a wooden frame for the old decrepit Denver and Rio Grande’s #223 which had been brought from a Salt Lake City park. 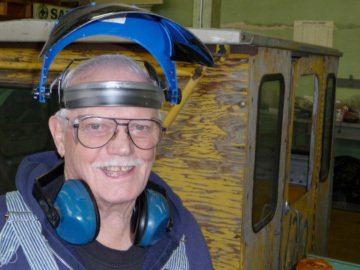 As a volunteer, Richard brought several shop talents, including milling machine operations and welding which became building blocks for the other disciplines required to restore the #223. When it became obvious that the restoration process demanded a dedicated shop, Richard went to work finding one. He was instrumental in convincing the powers to be to allow the volunteers the use a storage area for what is now the “shop”. This allowed the volunteers and get out of the old laundry building. He then brought his organizing talents to the front by arranging for heat, light and power. He also found many of the existing tools, including milling machines which allowed some serious work to be begun on the 223. Richard is always ready to lead, teach or do it himself. The community owes much of its current success to Richard and his get it done attitude. When asked what his volunteer experience has meant to him, he answered; “A lot of satisfaction and a lot of frustration”.